The Earth's climate continues to defy Al Gore's claims. Despite what Gore claimed on Fox News today, the scientific reality show Gore is wrong. Reality Check: 2017: Greenland Ice Mass Increases To Near Record – Arctic Ice Reaches Normal Range (May 24, 2017) – The vast majority area of Greenland has seen surface snow and ice gain over the past 9 months. Moreover, Arctic temperatures for now are below normal. Winter snow and ice cover trend for the Northern Hemisphere has in fact been trending upwards since statistics started. And when one applies the 30-year weather mean used to define climate, the winter trend since 1987 is strongly upwards. So is the autumn trend. This 2017 winter was well above average, ranking in the top 10. The vast majority area of Greenland has seen surface snow and ice gain over the past 9 months. Moreover, Arctic temperatures for now are below normal…The big development in recent Arctic news is the “recovery” of Arctic sea ice extent, which now is back in the normal range. Flashback 1947: Warming in Arctic, Antarctic & Greenland to cause sea level ‘rise in catastrophic proportions’ – Flashback 1947: ‘Danger seen in mysterious warning of Arctic Climate’ – May 31, 1947 – Warwick Daily News – “A mysterious warming of the climate is slowly manifesting itself in the Arctic, and if the Antarctica ice regions and the major Greenland ice caps should reduce at the same rate as the present rate of melting should reduce at the same rate as the present rate of melting oceanic surfaces would rise in catastrophic proportions and people living in lowlands along the shores would be inundated, said Dr. Hans Ahlmann, noted Swedish geophysicist, in a speech at the University of California Geophysical Institute. Reality Check: Analysis Debunks Absurd Sea Level Rise Claims About South Florida – Sea level rise in the Miami area is not accelerating and it is rising at a rate of about 1 foot per century. The problem is caused by a naturally occurring event known as a king tide, a rare event when the sun and moon align on the same side of the Earth during a high tide, and the extra gravitational pull produces tides much higher than normal. Gore has previously said there has been a three-inch sea level rise since 1992 when Hurricane Andrew struck Florida. 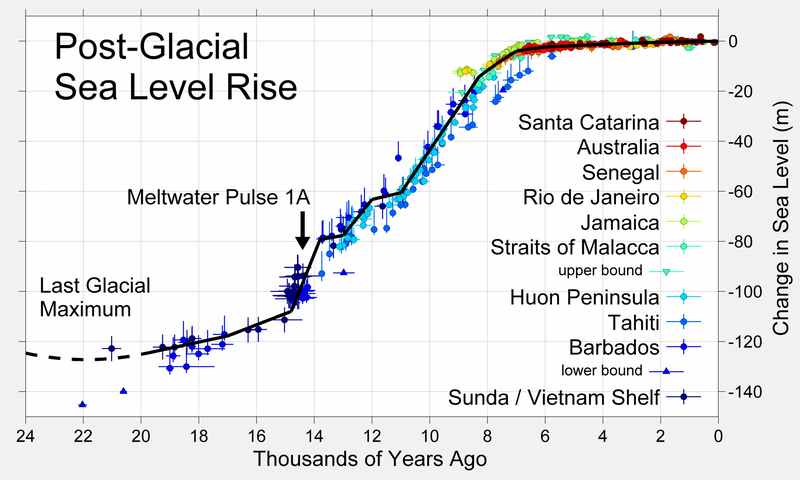 But tidal gauges and satellite altimeters show only a sea level rise of 1.2 mm per year. That would be about 28 mm since 1992, or 1.1 inches. He was off nearly 300 percent. Gore also brought up the unique phenomenon in Miami that allow “fish from the ocean to swim on the streets of Miami-Dade and Delray, Ft. Lauderdale.” But that assertion has no basis in fact, wrote the Miami Herald when President Obama made the same claim. Climatologist Dr. Roy Spencer: South Carolina Flooding is NOT a 1 in 1,000 Year Event – But a once on 1,000 year event? Sorry, but there is no way to determine that…there are simply not enough rainfall statistics over a long enough period of time to establish such a claim…Unfortunately, there seems to be an trend toward classifying events as “1 in 1,000 years”, when there is no way of knowing such things…For some areas the current flood is no doubt a 1 in 100 year event, or even worse. But remember, it is perfectly normal to have a 1 in 100 year event every year…as long as they occur in different locations. That’s how weather records work. LA Times: Gov. Brown’s link between ‘climate change’ and wildfires is unsupported, fire experts say – But scientists who study climate change and fire behavior say their work does not show a link between this year’s wildfires and global warming, or support Brown’s assertion that fires are now unpredictable and unprecedented. There is not enough evidence, they say. Chris Wallace pointed out it’s been 11 years since Gore made the claim in his 2006 film “An Inconvenient Truth,” and there doesn’t seem to be a planetary emergency. So did Gore admit he was wrong? Of course not! Greenland, for example, has been losing one cubic kilometer of ice every single day. I went down to Miami and saw fish from the ocean swimming in the streets on a sunny day. The same thing was true in Honolulu just two days ago, just from high tides because of the sea level rise now. We are going to suffer some of these consequences, but we can limit and avoid the most catastrophic if we accelerate the pace of change that’s now beginning.